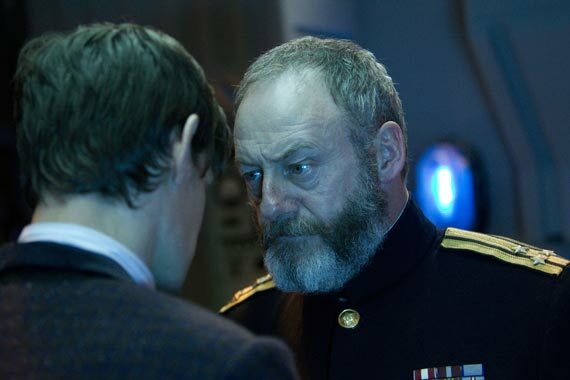 The latest episode in the Time Lord’s adventures begins, strangely enough, with Edmure Tully and Davos Seaworth piloting a Soviet submarine in the 1980s. The Cold War is in full swing(ish) and the submarine is playing host to a scientist with a frozen specimen that they believe might be a mammoth. In a sudden onslaught of events the submarine suffers damage and begins to sink followed by the TARDIS dematerialising in the bridge and depositing the Doctor and Clara, dressed for Vegas. Amidst the confusion the occupant on the ice is revealed not to be a mammoth but an Ice Warrior, a Martian soldier housed in a cybernetic armour. Not only that, but he’s a great hero of the Red Planet, and it is not happy. Over the next few hours that the submarine is trapped at the bottom of the ocean the chained Ice Warrior escapes form his cybernetic armour and wreaks havoc on the crew, looking get revenge for the slight against his honour as a soldier. Although they attempted to find a peaceful resolution the submarine crew and the time travellers start getting picked off one by one. With mistrust between the crew and a barmy, pop-music obsessed scientist tensions run high in an already dangerous situation. The first thing many viewers will notice about this episode (apart from the Westeros natives populating the bridge) is the direct and no doubt deliberate references to Ridley Scott’s Alien. Not that this is in any way a bad thing – more horror themed media need to be looking to classics from the 80s (such as The Thing) for the perfect way to milk tension from the viewer. Whilst the shorter format doesn’t give them time to give it the full treatment there are plenty of nice touches. The Ice Warrior dismantled them?! 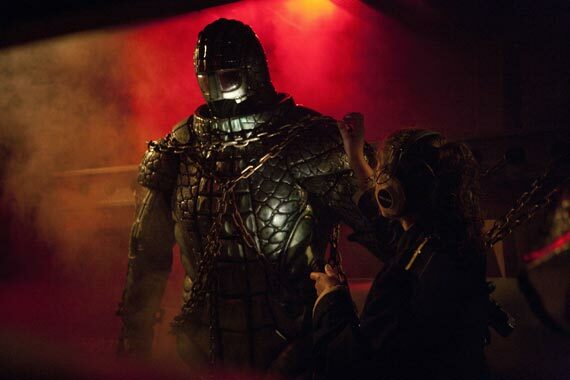 Newer viewers will be seeing the Martian Ice Warriors for the first time but they are actually a very old enemy of the Doctor. They first turned up in the series way back with the Second incarnation of the Doctor. They had a couple of worthwhile battles but they haven’t appeared in the series since the Third Doctor defeated them. Surprisingly they haven’t altered the rather camp design of the creature much at all. It’s much bigger in size and certainly light in a more menacing way. The Doctor sells the creature enough to make it intimidating in spite of being a big green man with glowing red eyes. When he leaves his armour and goes on the prowl he becomes even more frightening, being kept almost entirely off screen. When the big reveal comes at the end it can’t help but feel anti-climatic. It may have left a greater impact if left more. ersonality. She steps up by trying to negotiate with the Ice Warrior and has some interesting dialogue with the scientist. It feels as though this was going to be taken further but ultimately seemed to be a red herring. Again, not a perfect episode but this is still a strong season. Every episode has it’s own distinct flavour and takes the characters in an entirely new direction. Reviving a classic yet forgotten villain in a unique setting makes this a solid part of the collection.